At least Diploma, Bachelor’s Degree in Mass Communication, Marketing, E-commerce or equivalent. Work with developer and marketing personnels to give the best user experience and user interface for Nashata customers and audiences. Design, create and edit visually stunning online content for various digital platforms. This includes but not limited to website, social media, eDM and posters. At least Diploma, Bachelor’s Degree in Digital Design, Arts, Creative Multimedia, Animation, Information Technology or equivalent. At least one-year experience working in related field. Knowledge in branding is a plus. Create and manage content on Nashata digital channels. Engage with Nashata’s online community, sporting communities, customers and associates. Track the company’s digital channel performance and work with the management team to grow and keep digital performance positively. Produce and share company online newsletter on Nashata digital channels. Knowledge and experience managing Facebook page, twitter, instagram, youtube and other digital channels. Most of all enjoy doing it. Knowledge in managing external analytics and online advertising channels like Google Analytics, Google Adwords and Facebook Advert. At least Diploma, Bachelor’s Degree in Computer Science, Computer Engineering, Information Technology or equivalent. Able to work on integration with web and open source web platforms. At least one year experience working in related field. We welcome talents who are willing to learn and driven to try out new things to apply. If you are up to the challenge, email your resume at contactus@nashata.com. Deadline : 30 April 2019. ‘For a Better 2017’ to ‘Woman Up 2018’! 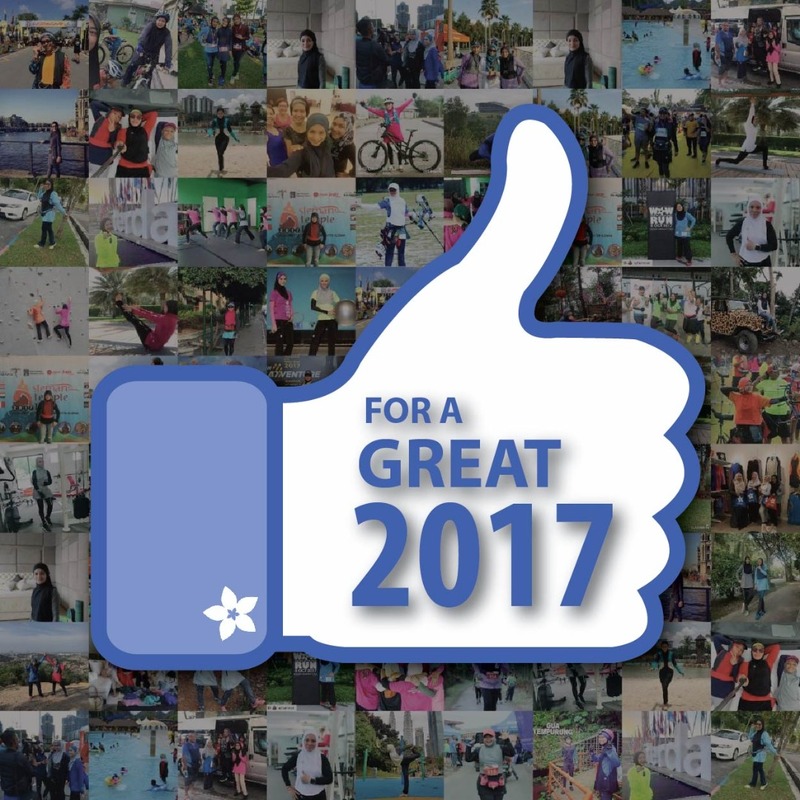 The year is coming to its end and we hope you are achieving your goals, especially your fitness goals. Nevertheless, here’s a thumbs up 👍 for all of us – for trying, for training, for getting up early, for reminding each other to eat healthy and keeping fit, for sharing, for motivating each other in our own ways, for pushing the boundaries, for breaking stereotypes, for friendship, for not quitting, for taking care of ourselves and the list goes on. Fitness is a lifestyle, a journey, so let’s continue improving our routines. The theme for 2017 is #ForABetter2017 and alhamdulillah, 2017 is a healthy year for our dear customers, partners and us. We get more and more sharing from our beautiful sisters – about their victories and fitness journeys, we get to build more innovative products and foster friendships and partnerships with amazing people across the globe. 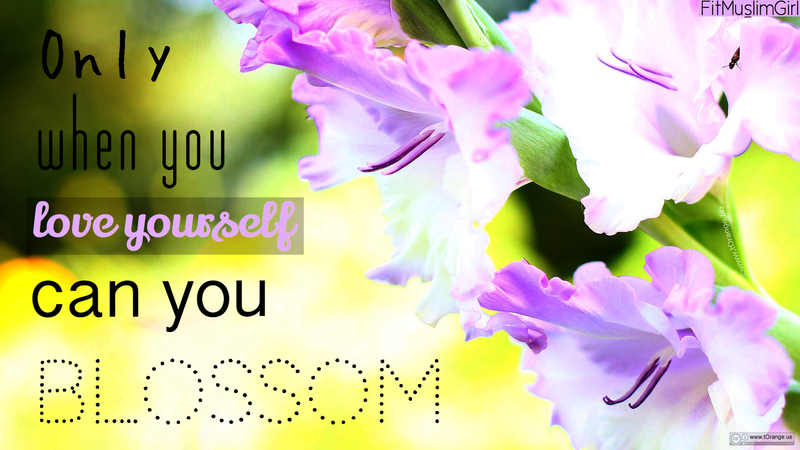 Best of all – to know that we are all growing in our own ways, every moment. We produced sports hijab designs which are sport-focused. This is to suit the nature of certain sports and dress guidelines. 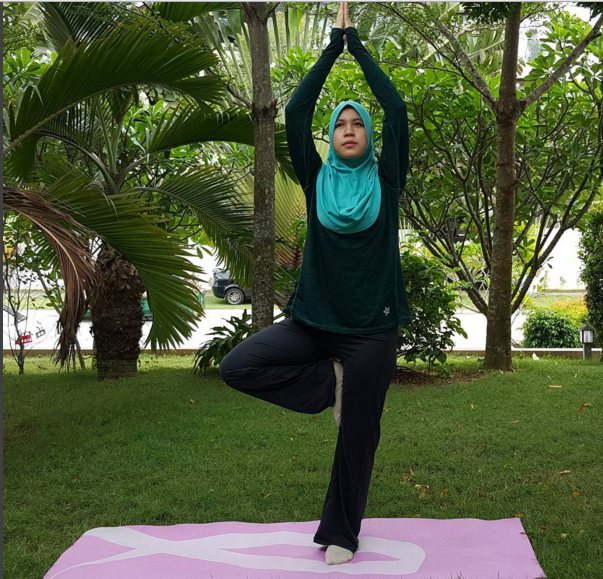 For example, the Hooda Racerback Sports Hijab is for cyclist and runners, while the Hooda Ellipse Sports Hijab is suitable for yoga and inversion. Raazglove with improved fabric is suitable for archery and shooting. We also added useful features into our designs. Tunes Series Sports Hijab – are earpiece-friendly as they have small holes for you to insert and remove ear pieces from the outside. 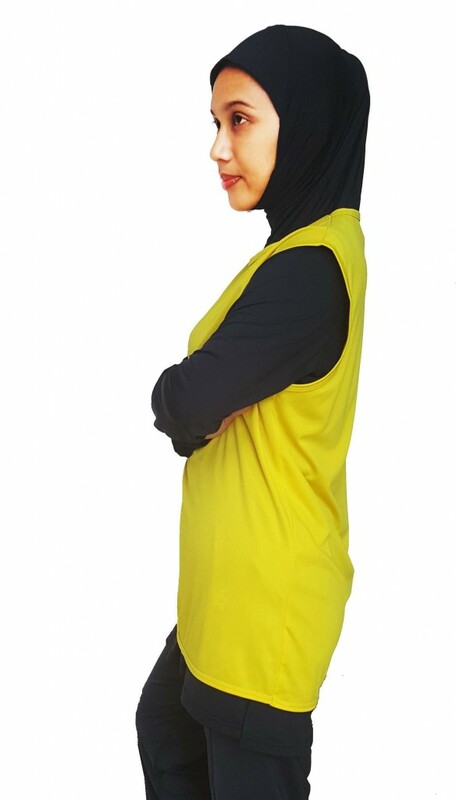 We added pockets with zip for the Hooda Sports Hijab and the Hooda Racerback. If you want to stay active and comfortable, you need good athleisure-wear. We produced more leisure-type designs, with affordability and comfort in mind. The fabric is soft and lightweight and designs are simple and pleasant for leisure and vacation! 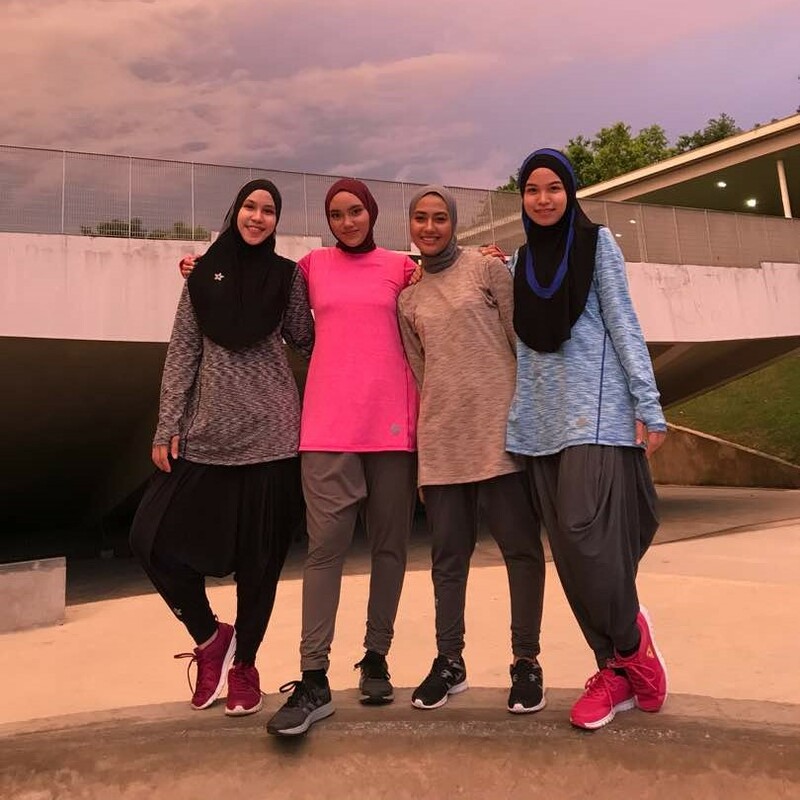 Some of the athleisure designs are the Hooded Cardigan, Athleisure Top, Athleijab (RM39 only), Kebaya Sports and the Hattha Pants. 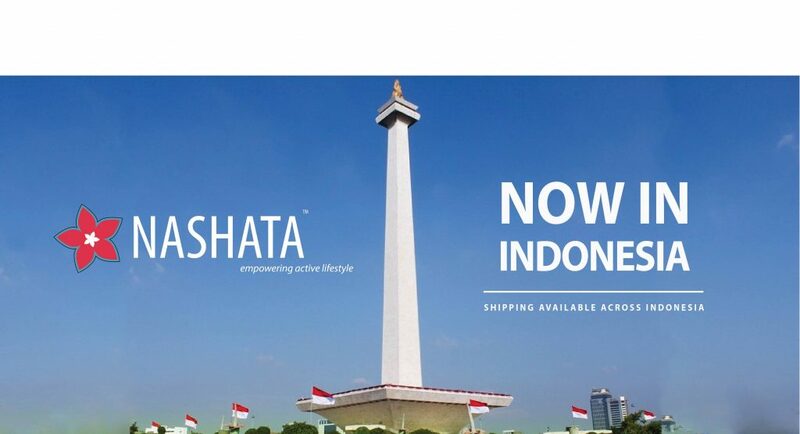 Improved shopping experience at nashata.com. The webstore is more mobile friendly, you can find products easier and now, you can add reviews. Making an impact for women in universities through Nashata University program. We understand the growing challenges as students to watch weight and eat healthy food and we care about them. 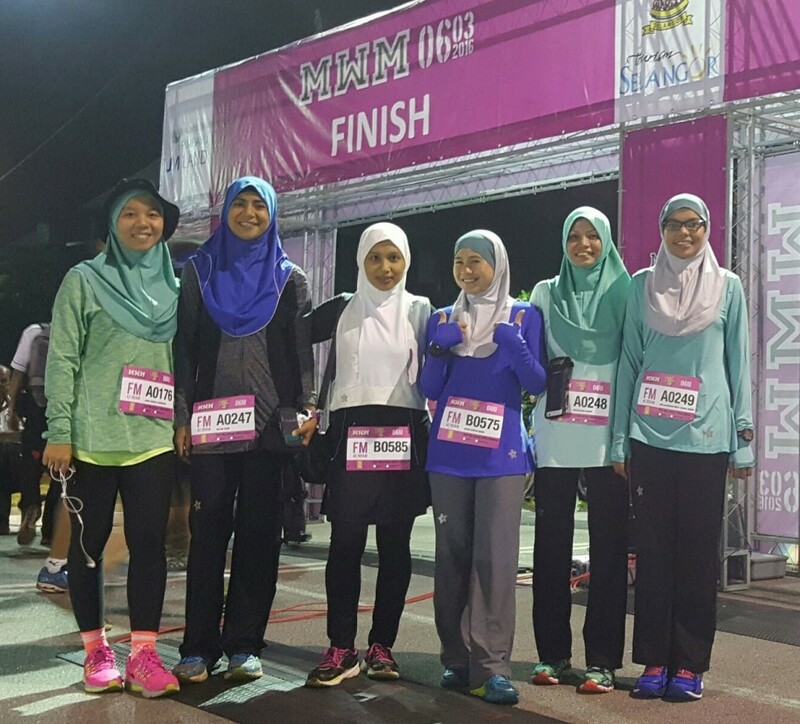 Hence, it is our goal to foster active and healthy lifestyle among our sisters in universities. More to be shared soon, insyaAllah. We would like to foster more confidence and empowerment within ourselves and our sisters. Let’s push the boundaries and explore excitement in fitness at different levels. It can be about learning new sports, participating in new races, overcoming our fears and limitations. Remove boundaries, and let’s progress together. Everyone knows that Nashata’s swimwear is designed with performance in mind, tested by active women who are serious about sports yet still want to remain modest. It has proven to be great for swimming in the pool, and also for the open sea. 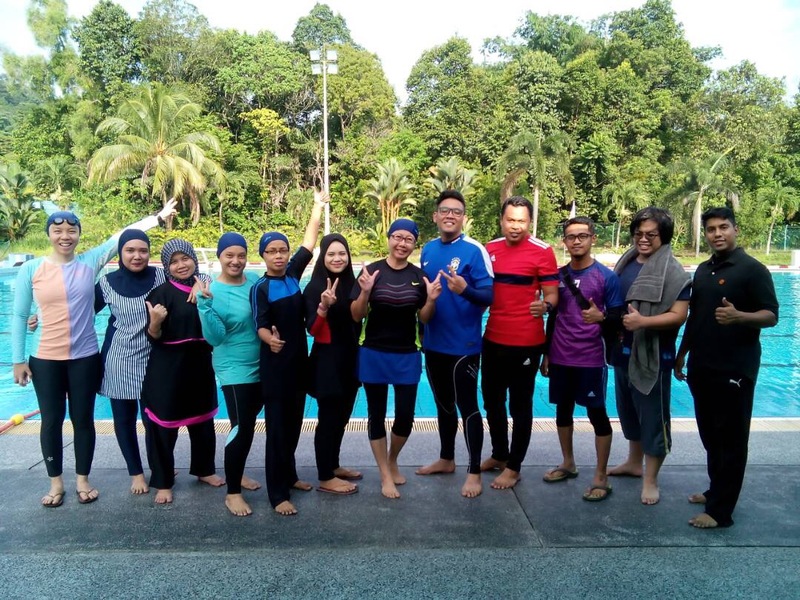 So for this week, I tested the swimwear for a different water sport: Water Polo. This review written is entirely my own experience based on my beginner’s knowledge on water polo. I am not an experienced water polo athlete, but I do swim regularly. 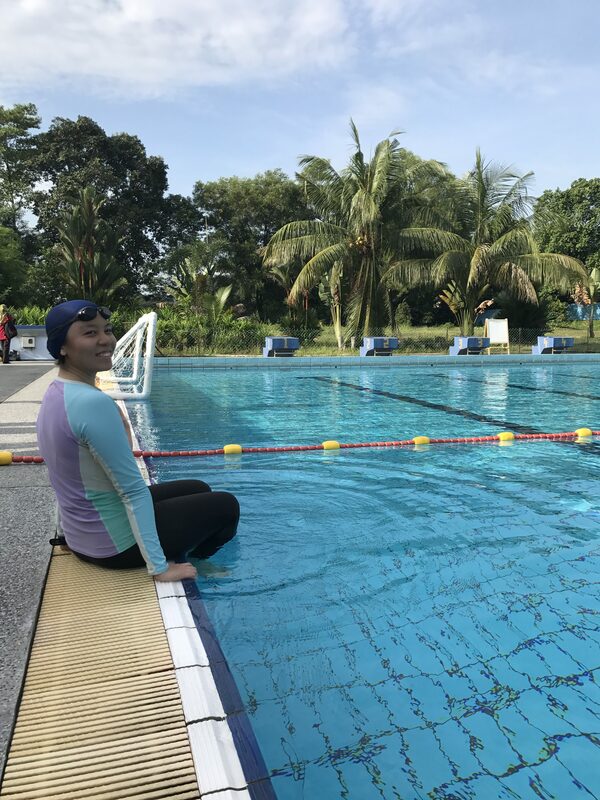 If you have no experience in water polo, the easiest way for me to explain is that it is like a game of netball in the water, but the only difference was that you are allowed to move with the ball as long as you are swimming. 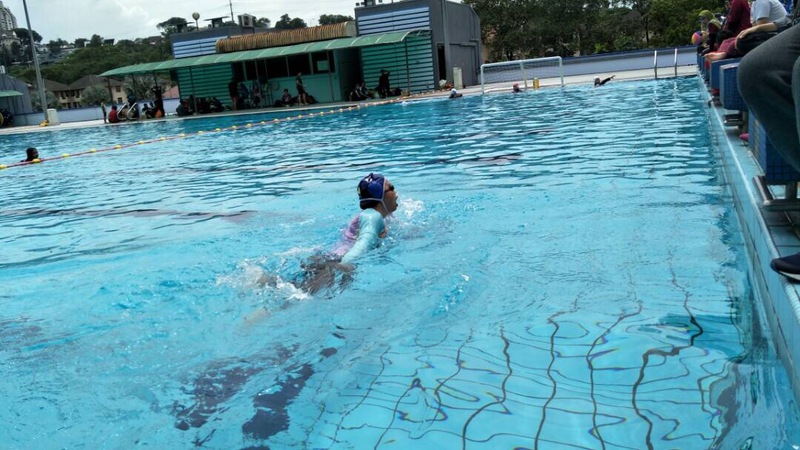 Therefore, besides swimming, it involves a lot of quick movements such as jumping, diving, passing or blocking the ball. Plus point: It has chest and crotch lining so your underwear is not visible despite having those areas stretched out. 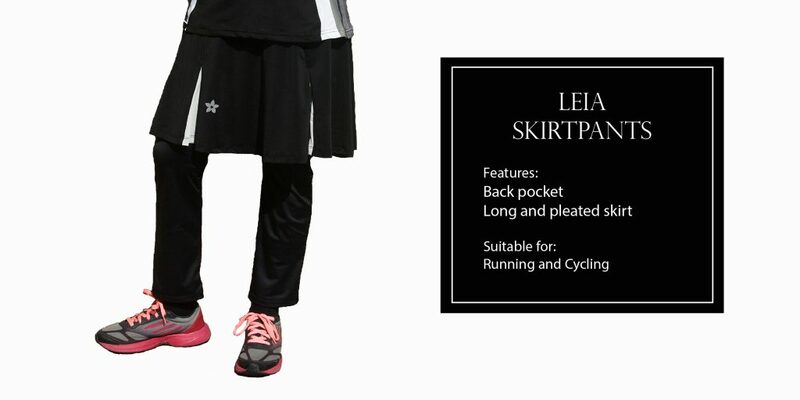 It is also best worn with a sports bra. I am at the most left. The body suit is underneath my top, and goes down to my ankles. The top and swimming cap is my own. I am not distracted about any potential wardrobe mishaps that might happen. Through out the game I have witnessed a few unfortunate incidents of ladies tugging or adjusting their clothes to keep their modesty, or having their clothes get in the way of giving their 100% performance. I did not have to stop playing to tuck in my top or were unable to raise my hands as high as I needed to to catch a ball for fearing my swim wear might float up (which was the case for most modest swim wear). The body suit in action. Unlike most modest swim wear, I am not worried is the top floats up when I swim or jump or dive because I am covered underneath. No wardrobe mishaps! Despite being tight, it is very stretchable. Swim wears are meant to be body-hugging anyways, because that will allow for fast movements in the water. However, for a more modest look, you can always buy the Sibaha swim wear (sold separately) and use it on top of the body suit. Unlike other modest swim wear that came with unnecessary piping or seams, or skirts that did not serve any function, this swim wear is streamlined. As it was designed with the athlete’s performance in mind, it does not include “frills” or decorative designs that might add weight to the swim wear, which will affect the swimmer’s speed or strokes. I love that it is a single piece with only a zipper at the top, so water can smoothly glide over my arms and legs without any hindrance. Ready to make my sprinting swim to make sure I get first possession of the ball. Thanks to it’s streamlined design, I can swim as fast as I could. In conclusion, thanks to this body suit, women who would like to remain modest have no excuses or hindrance to swim and enjoy the water. So, what other water-based activities should I try in this swim wear? Shop at Nashata.com for Best Buys & Great Support! It came to our attention that Nashata products are sold in a market place at over-inflated prices. We would like to notify that Nashata and its partners are not involved in any of the listings. Nashata and its partners are always working on ways to make our products affordable and fair to our customers across the globe. 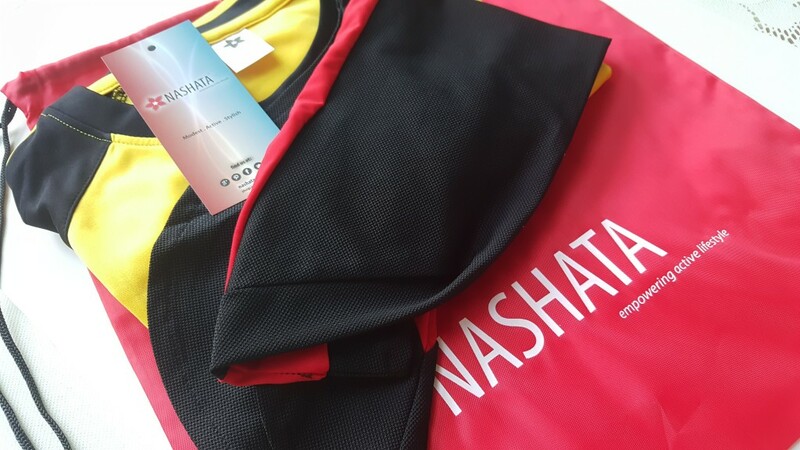 You can get the best price and best shopping experience at nashata.com. We assist all our customers with purchases. Use vouchercode SUPERFIT to enjoy 5% discount and you can collect Reward Points when you purchase online.The shipping fees for Malaysia is RM7 and we ship via POSLAJU. We also offer COD for RM11 in West Malaysia. Nashata authorised distributors and resellers sell Nashata products based on retail prices in Ringgit Malaysia, as you see at nashata.com. There may be slight price variances due to fluctuating exchange rates. Below are the FLAT rates to various regions. What this means is that you can order as many as you wish and the shipping fees remain unchanged. It takes 2-10 working days for Asia/Oceania and 5-20 working days for other regions further from Malaysia. Shipment to Brunei, Singapore, Indonesia and Middle East typically takes 2-3 working days. 16, Jalan PJU 5/1, Kota Damansara, 47810 Petaling Jaya, Selangor, Malaysia. 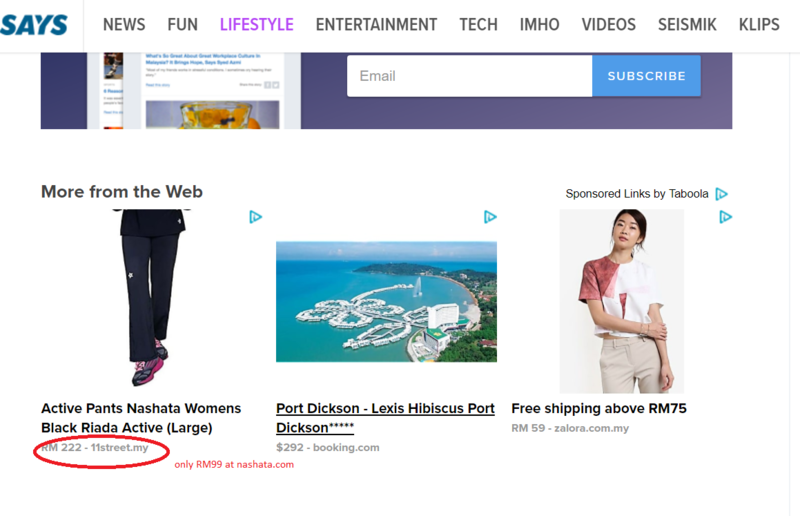 If you see advertisement of Nashata products on the internet, do verify the prices at nashata.com. Buy the original and the best at nashata.com. Email customercare@nashata.com or whatsapp +60123112489 should you need any assistance. 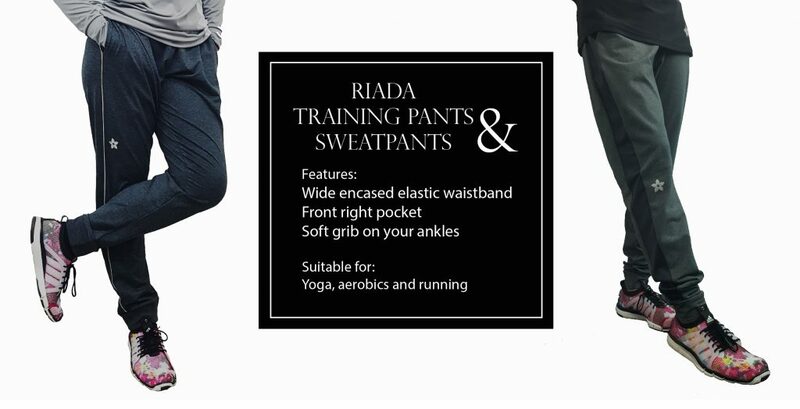 Have you ever cared about wearing the right pants for every activities you do? Well, as most of you know, different types of pants has different purpose of use for activities. The wrong attire always gives you discomfort when you perform activity. So, here are few guidelines for you on picking the right pants. You need to look at the design, fabric and features of the pants. For example, a good running pants should be light weight and fast drying. If you plan to work out indoor or at the gym, you can put on pants with thicker fabric. Tights and leggings are good for aerobics. Choose designs that suit your body type as well. 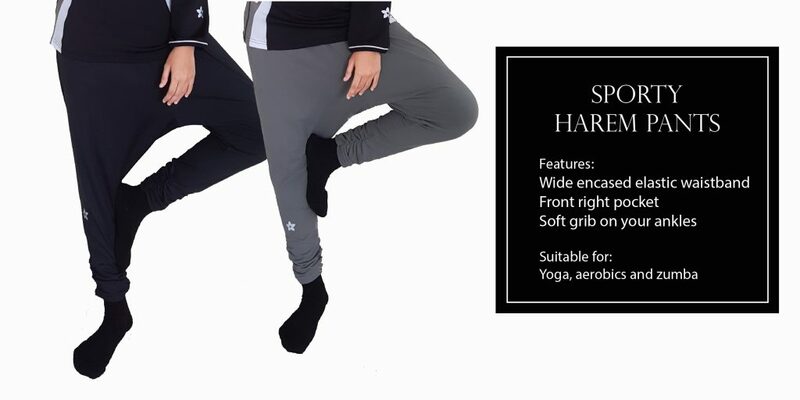 If you have chunky legs, avoid wearing tights, and if you plan to stretch a lot, and conscious about revealing your legs, you can consider the harem pants. You can wear designs that are tight around waist area – giving the support that you need. Check the features of the pants you plan to buy; placement of pockets, safety features, support on certain parts of body and length. Dear sisters, hope this helps you in making the right shopping choices. Run swiftly and fast like a gazelle in Azza Toplectic. 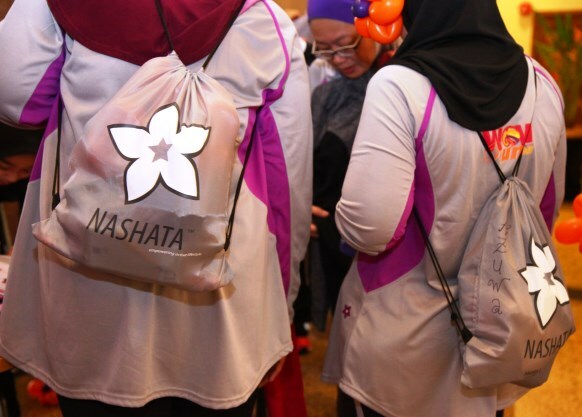 Toplectic is Nashata’s new product range that combines head covering and sportstop for athletes looking for seamless modest sporting experience. AZZA is the first release for Toplectic range. It is simple, lightweight, long and loose cut. Suitable for athletes looking for performance in running, cycling and sporting activities that require jumping and rolling. 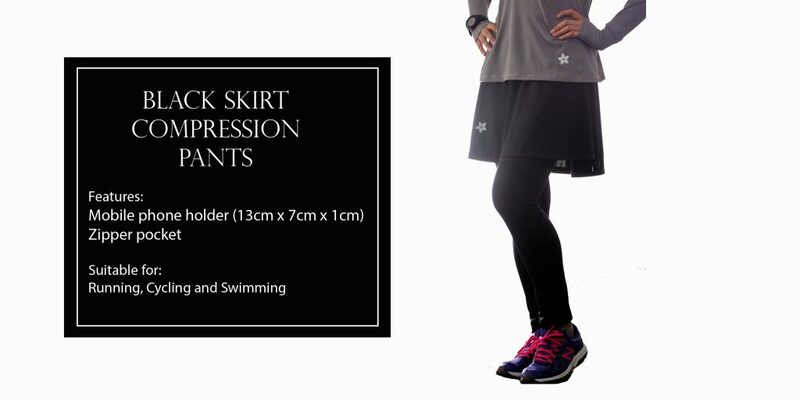 The fabric is made of spandex and polyester and not suitable for swimming and wet activities. Wear event shirts with only 2 layers; Toplectic in the inside and event shirt(assuming it is short sleeves or sleeveless) in the outside. You need not wear additional hijab. If you don’t want the hijab on, you can put it down and get a cowl neck top. Fancy huh? There are 3 colors (black, blue and grey) and 5 sizes you could choose from S/M/L/XL/2XL. 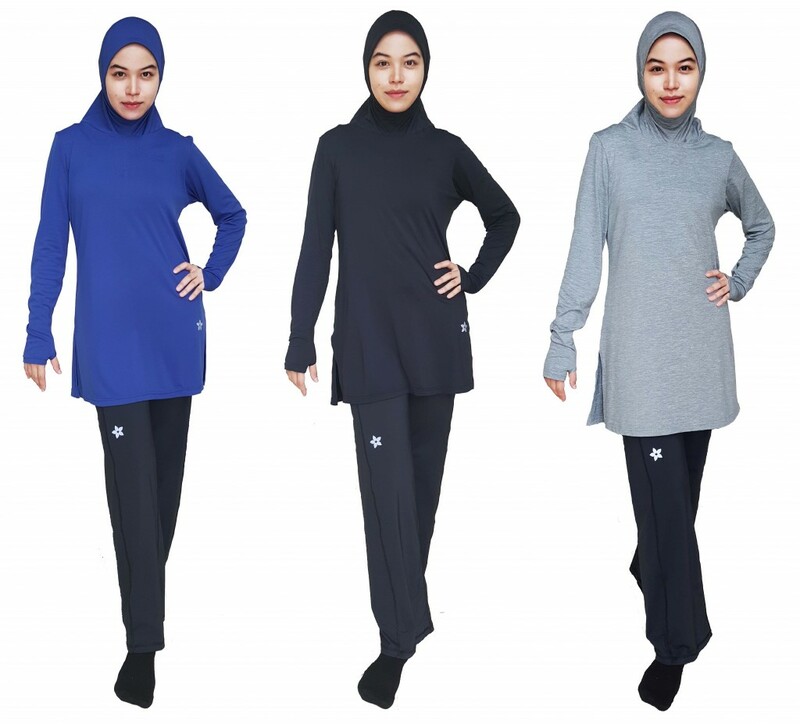 With only RM129/USD32, you get the absolute performance top for hijabi athletes. We offer early bird price of RM109 for purchases made by 1 July 2016. Purchase yours now at nashata.com. The people at Nashata believe in being socially and environmentally responsible for the community and planet. We try our best to reduce use of plastic and paper, and provide usable items to our customers. We want to simplify your task. Rather than just throw away the plastics, we are recycling the plastics so we can conserve the earth. 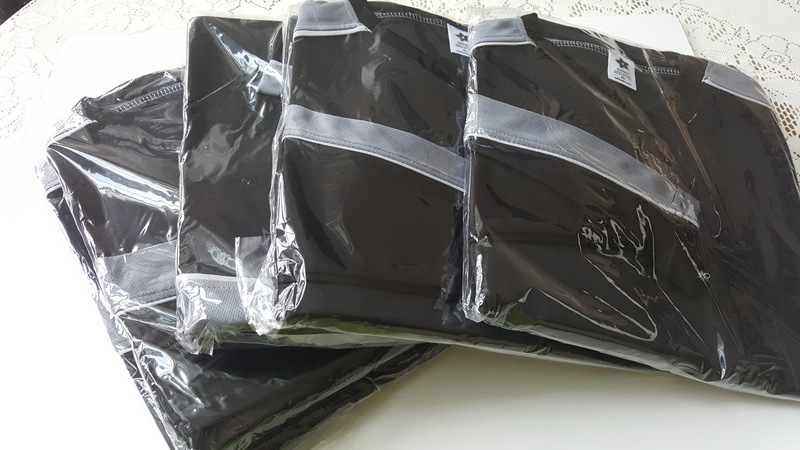 That is the reason why when you receive shipments from Nashata, you will find your purchases in reusable drawstring bags, with none or only one plastic bag in it (only if you purchase many items). You won’t even find product tags in the shipment. We perform Quality Check (QC) on each item prior to shipment. Unpurchased items are stored in plastic bags (as shown below). We only remove the items from plastic bags during QC. We then collect and send plastic bags and papers to recycling center in Cyberjaya once a week. Since we have all product information online, and all our customers are cool netizens, our customers can find necessary information at nashata.com anytime, anywhere. However, do look for Nashata bookmark in your parcel. This bookmark also entails product care information. If you look closer, you will find discount voucher too. Why do you get a Drawstring Bag? We pack all our products for shipment into Nashata drawstring bags. You will find your purchases in different bright colors every time. Let it be a surprise. You could use the bag during fitness sessions and even when you travel. Just toss your towel, change or workout attire into the bag. We always want to provide you something usable in our shipment. So if you have feedback on how we can improve going green, or useful items you would like to get from us – do drop us a note at contactus@nashata.com. We would love to hear from you. Did you know that until 1967, no women participated in a full marathon event? Katherine Switzer broke that record and signed up as a gender-neutral “K. Switzer” in Boston Marathon. When reporters realised she was a lady, she made headlines. 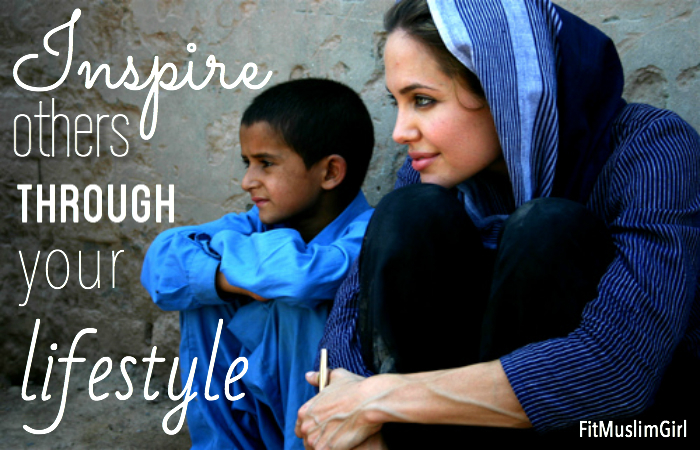 She continued fighting to empower women in sports, and the rest is history. Imagine what would have happened if Katherine Switzer decided not to run! I am so glad that female-friendly races are becoming more common these days. 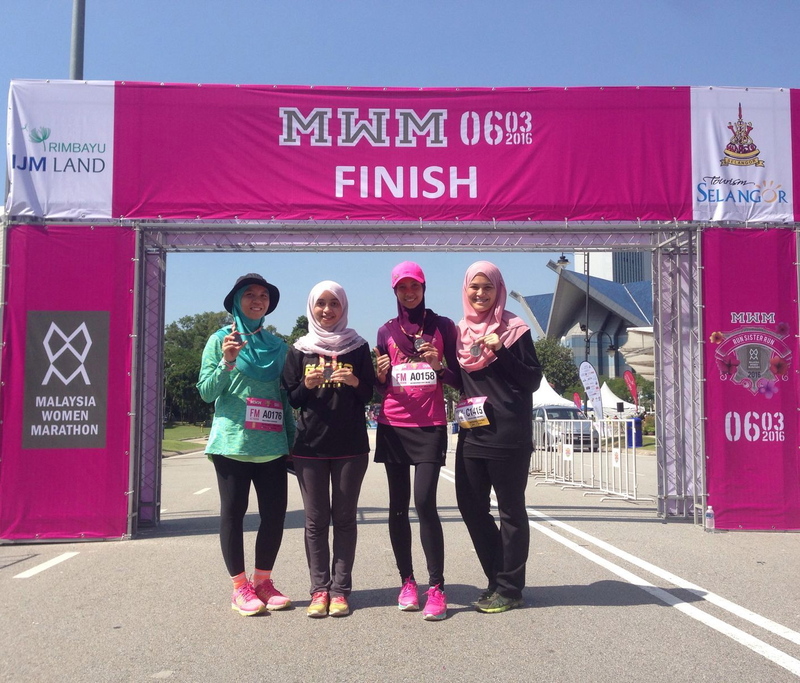 Fast forward to 2016, inspired by Katherine Switzer’s legacy, I was honoured to run under Team Nashata in the full marathon category for Malaysia Women Marathon. 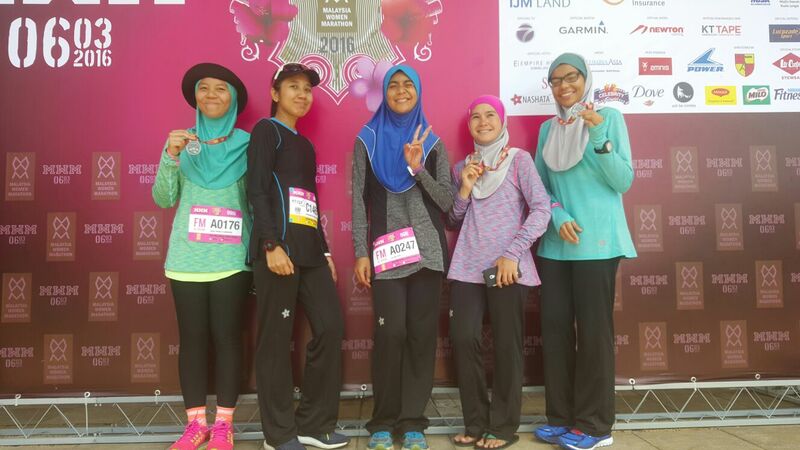 An opportunity to run with the ladies of Nashata? Why yes of course! When the gun goes off at exactly 4.00am, it’s show time. Game face on, it is time for a second shot at completing a full marathon. This time, the challenge lies not in the distance, but in the cut off time. I have never completed a full marathon in 6 hours and 30 minutes. 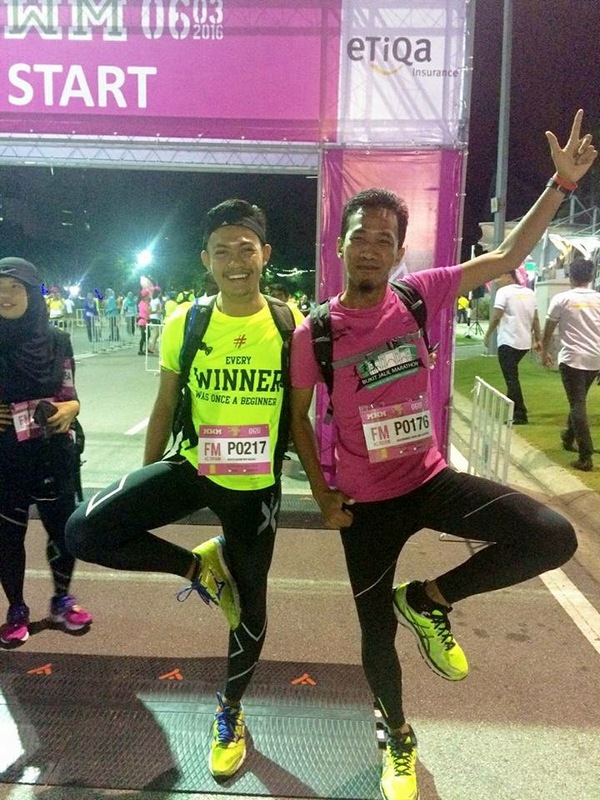 My personal best at 42km was during Pink Ultra when I clocked in just slightly under 7 hours. So shaving off 30 minutes will be a struggle. Excited for pacer duties, boys? Everything was fine and I was ahead of schedule up to the 30km check point. The last 10km was the hardest part, especially the highway route. The rolling hills along the LKSA highway, the heat, the emptiness…you can run for miles without bumping into anybody. The highway route felt like forever to complete. At this point, it was a battle between the mind and the body. Many people started walking, and I felt like I should start walking too. I was glad that I had my pacer with me. We didn’t talk much, but at least he was there to keep me company. 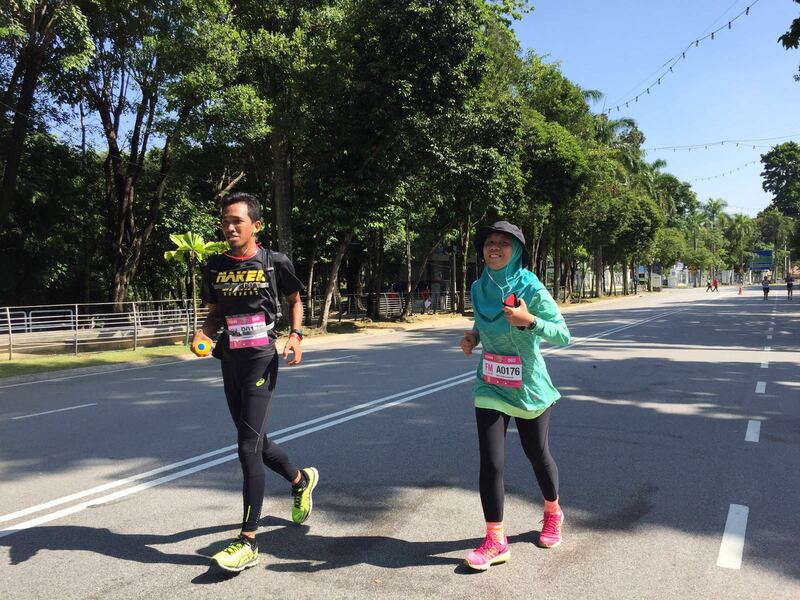 He pushed me to continuously run, no matter how slow I went, which I tried to abide to (in protest!). In the end I ended up with the walk-run-walk-run cycle just like everyone else, and my pace fell dramatically towards the end. 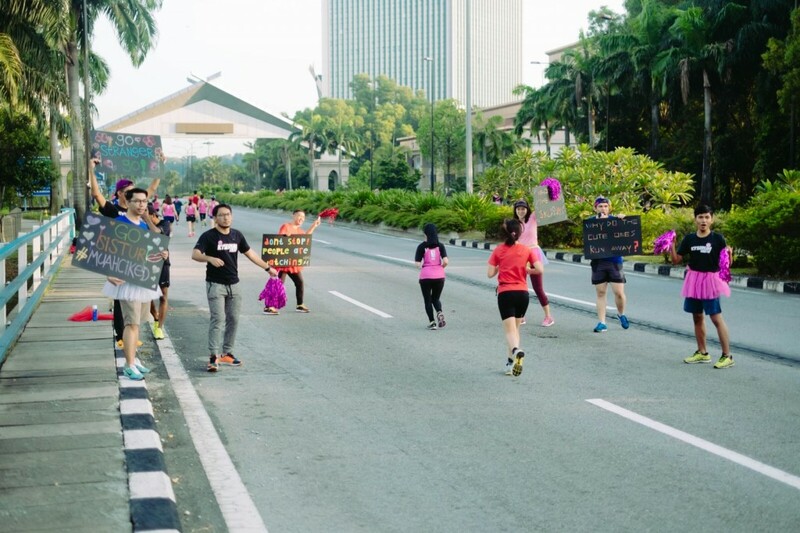 Not to mention the confusing signage and unclear direction from the marshall at the 38km, causing most participants to lose precious time hesitating which direction they should go. Hunger was slowly settling in too. But I was surprised that the only food provided along the way was only bananas, apples, and pears. I was accustomed to seeing at least some biscuits, chips, ice-cream, or at least Coca-cola in most long distance events, so the lack of sweet and salty snacks spread was pretty surprising. Luckily, I had my energy gel with me, and my pacer bought along some protein drink mix. The last few hundred metres push. Believe me, I wasn’t smiling if it wasn’t for the camera. Spotted any of these cheer squad along the way? Boys, your macho level and manliness just went up a notch in those tutu skirts and pompoms! I managed to conclude my 2nd attempt at a full marathon in 6 hours and 33 minutes, exceeding the cut off time by 3 minutes. Now I wished that I listened to my pacer because he was right when he said “Hey no pain, no gain, girl!”. I have to train harder for my next full marathon in a few months time, because it is not fun being among the last ones to arrive! Full marathon and half marathon finishers. When people think of diet and exercise, weight loss is usually the first thing that comes to mind. However, there are countless reasons why people engage in a healthy lifestyle and weight loss is just one of the reasons. People may decide to take up exercise to build strength or muscle, to get faster, to improve overall health, or even as a means of socialization and keeping busy. Whatever your aim may be you need a proper workout plan that will help you reach your specific goal most effectively. Here are the best ways to reach five of the most common fitness goals. Plan of action: When it comes to losing weight and keeping it off, there’s a lot to think about. It is recommended to dedicate 3-6 days a week to cardio for 30-60 minutes. It’s also a good idea to incorporate strength training into your routine about 3 times per week. Building lean muscle tissue will aid in the fat-burning process. If you really want to burn a lot of fat but don’t have the extra time HIIT workouts can take as little as 8-20 minutes. It involves short bursts of energy followed by an active rest period. Examples of HIIT workouts are sprinting and plyometrics. Plan of action: Although I’ve grouped muscle building and strength building together they are actually two different goals. While both goals call for resistance training, muscle builders are training for size while strength builders are training for strength and endurance. In general, muscle building requires lighter weight as you should be lifting one to six sets of eight to 12 repetitions. Building strength requires lifting heavier weights for less repetitions. A strength goal should incorporate one to five sets of weights for one to eight repetitions. Plan of action: Some people neither want to gain nor lose weight but aim to maintain a healthy lifestyle. In order to maintain a healthy weight/lifestyle one should workout 3-5 times per week and should mix it up between cardio and strength training. Lean muscle helps to burn fat even while at rest so strength training is great tool to keeping your body in maintenance mode. 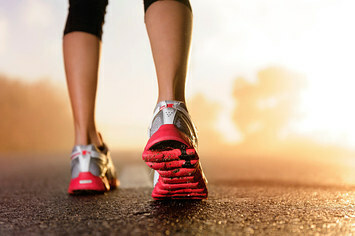 Cardio can be anything you enjoy like walking, running, biking, swimming, yoga, etc. Plan of action: If you want to increase your running speed whether it’s for a 5k, a mud run or a marathon, consider adding specific drills into your routine. Sometimes people think that if they want to run a faster mile they should train by always running a mile until it gets faster. But the real way to amp up your speed it to switch up your routine. Try adding some sprinting and strengthening drills into your normal running regimen like sprints, pushups, lunges and squats. Drills can be added in as part of a dynamic warm-up, they can be added after your regular run, or you can even dedicate a few sessions per week just to drills. Plan of action: If you want to get your workout in all the while interacting with others, try a gym membership. Group fitness classes are a great way to interact with others who share similar interests. Many times you will see the same people attending the same classes so it’s easy to get to know each other. Not to mention the motivational atmosphere of ‘all being in it together’ really helps give you that extra push. Plan of action: First you have to figure out what relieves your stress. 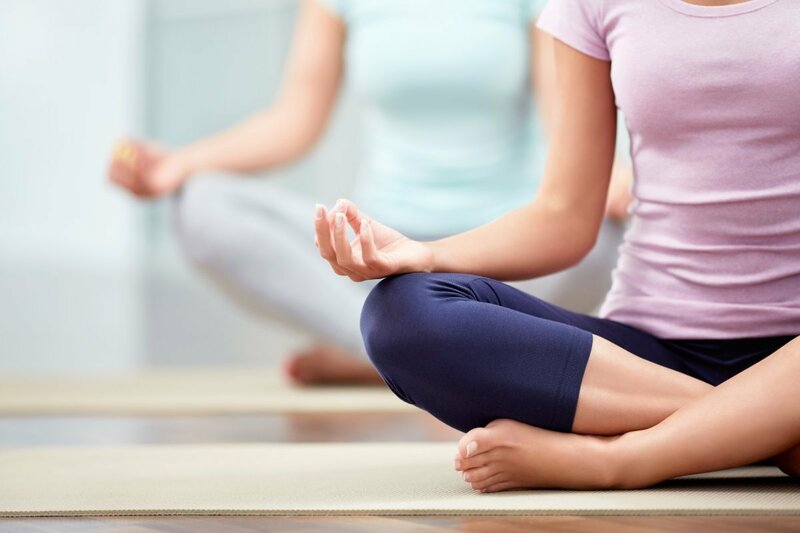 Some people might benefit from light yoga classes that involve meditation and relaxation, while others may find that a sweaty kickboxing class really helps them to take the edge off. You may even benefit from a mix of both. Take one or two days a week to engage in relaxation and take another few days to attend a kickboxing class and let it all out on the bag. If you feel you have been putting everything into your workout but are not seeing that outcome you would like, it may be that you are not training the right way for your specific goal. I hope this post can help to shed some light on the different methods of training that go along with different goals. Wearing the hijab comes with a heavy responsibility. Not only are we, as women and mothers, the role models for our children, but we represent our families, our communities and our religion. 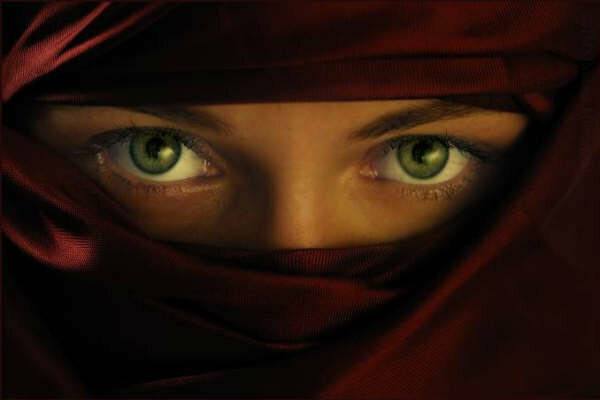 When people look at a Muslim woman the first thing they see is her scarf. Someone who knows nothing about Islam is likely to judge the entire religion based on the actions of that woman. Therefore, it is up to us to uphold the morals and values of Islam as best we can. 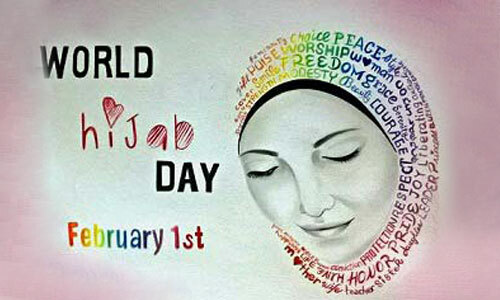 As World Hijab Day is nearing, I thought it was a good time to reflect upon the hijab. I wanted to reflect not just on the importance of the hijab itself but how it has shaped my life, particularly in my field of work as a fitness trainer. I’ve been wearing hijab for about one year now, alhamdulillah. Of course, the hijab changed me in so many more ways than just my choice of clothing. Hijab started off as something physical. It made me look different. It made me look Muslim. It hid my hair and body. It acted as a barrier between me and strange men. But as time went on it started working a little more deeply. I began to notice that I was being respected. People were forced to look at my eyes and not my body. I felt proud of the courage I had to wear it regardless of what others thought. I became more aware of my actions and words. 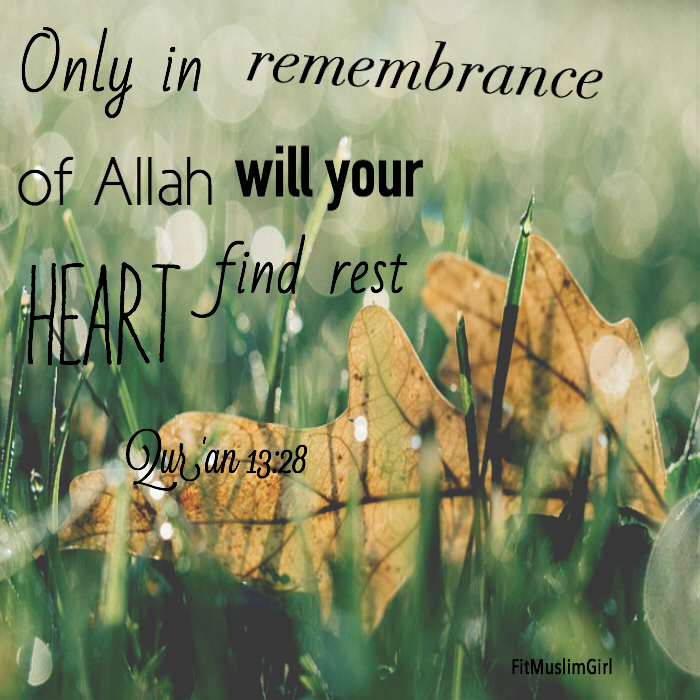 And most importantly, I felt a deeper connection to Allah (swt). While hijab was helping me in many ways, it was also hard. 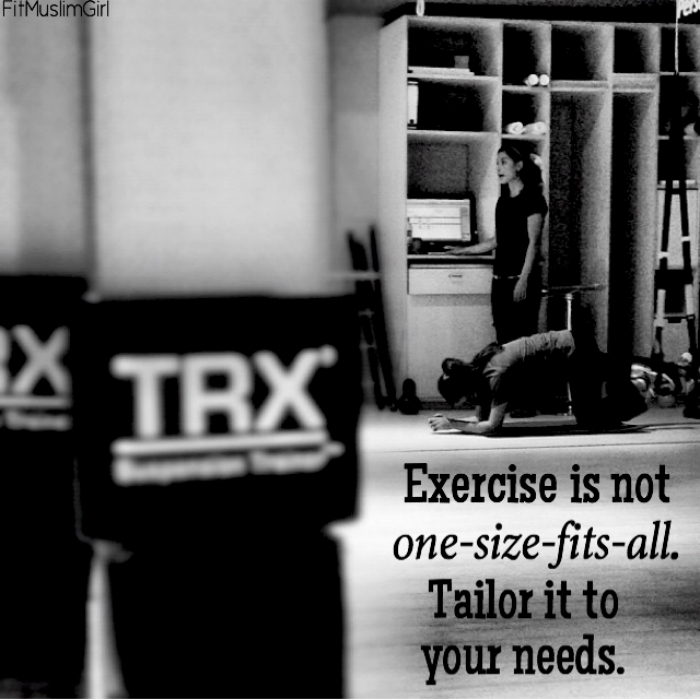 The hardest part about hijab for me was fitness. As a trainer I thought, “who will want to be my client if I can’t prove to them I have what it takes?” I thought proving I was a good trainer meant showing off my hard-earned muscle as a way to prove I was fit and able. I didn’t think people would take me seriously. But I trusted Allah (swt) and knew that if I had given something up for His sake, He would give me back something better. As a trainer I had always said health and fitness was about more than just looks, but I never truly felt it. Putting on the hijab helped me to truly grasp the concept of inner health. Of course, I still wanted to look good and be happy with my body, but that became less of my aim and focus. I started feeling beautiful on the inside. I was eating better food; I was eating food for their nutrients and the benefit I could gain from them, rather than just eating for low calories. I developed a more well-rounded sense of health; a sense of health that enveloped full-body awareness. Awareness of the mind, body and spirit. Religion actually became a part of my health practices, and health became a means of worship and giving thanks to Allah for all that He blessed me with. And I think that this radiated off of me. I realized that I was still getting clients. I realized that I now had the power to not only talk about full-body health, but to promote it through my own lifestyle. People may not be able to see my body, but is that a true indicator of a healthy person anyways? A healthy person is someone who works not only on their bodies but on their mind and soul as well. A healthy person is someone who balances between food they love and food that is nutritious. A healthy person is some who feeds their spirit. A healthy person is someone who recognizes the issues surrounding this world and lends a helping hand. A healthy person is someone who practices patience, gives their body a break when it needs one, and loves themselves through every step of their journey. As hijabis, we have that power to change the fundamental notions of society. We don’t have to live by the idea that beauty and looks are everything. We have the ability to force people to look at our hearts, personalities and intelligence. We have the ability to help other women who believe that their worth lies in their beauty alone. 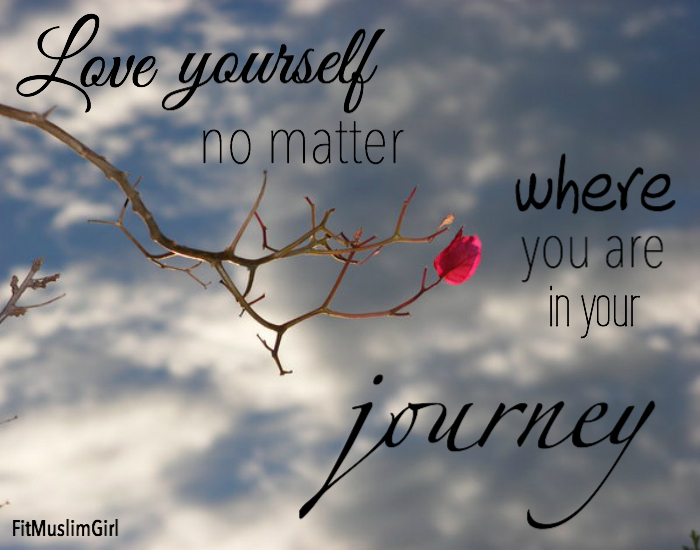 We can promote self-awareness and self-love. We have the choice to use health and fitness as a means of worship and showing gratitude, rather than using it to flaunt our bodies. As Muslim women, we have an obligation. 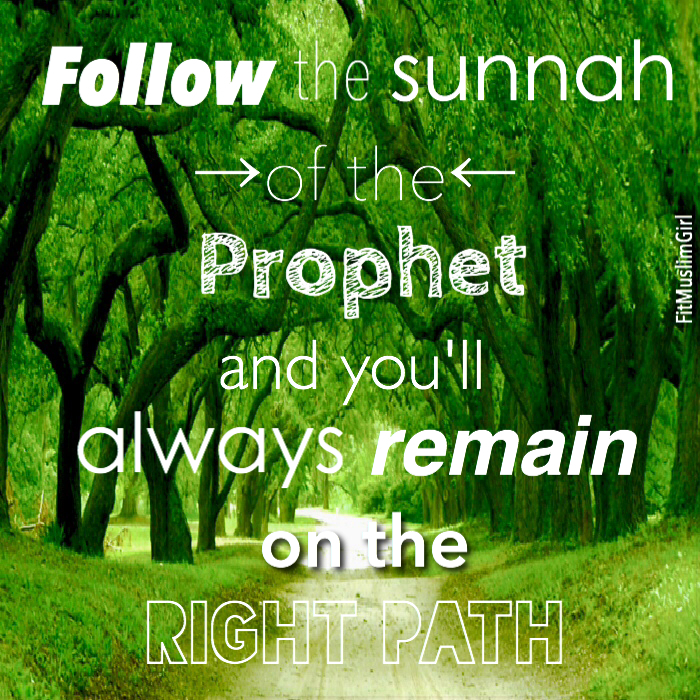 An obligation to follow the Qur’an and Sunnah regardless of the barriers our society may put up. Hijab can evoke fear in some people, especially in Western cultures. But if we wear our hijab with confidence and dignity and portray as many characteristics as our beloved Prophet (saw) as we can, we can change that. We can stand up for women around the world and show that health is so much more than our external being. We are unique. We are beautiful. 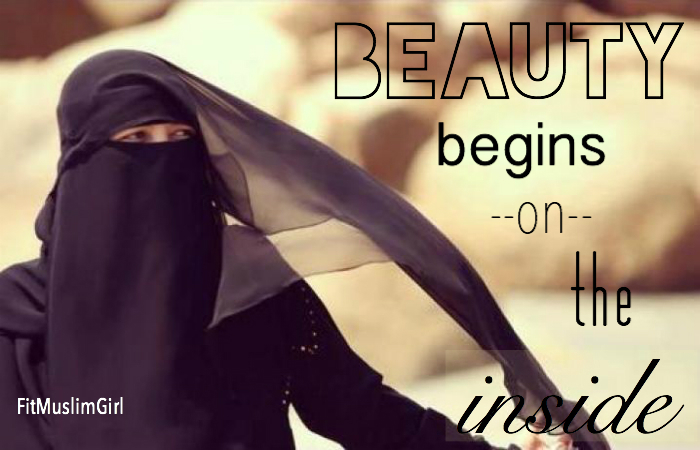 We don’t hide behind our hijab, rather, we use it to blossom.